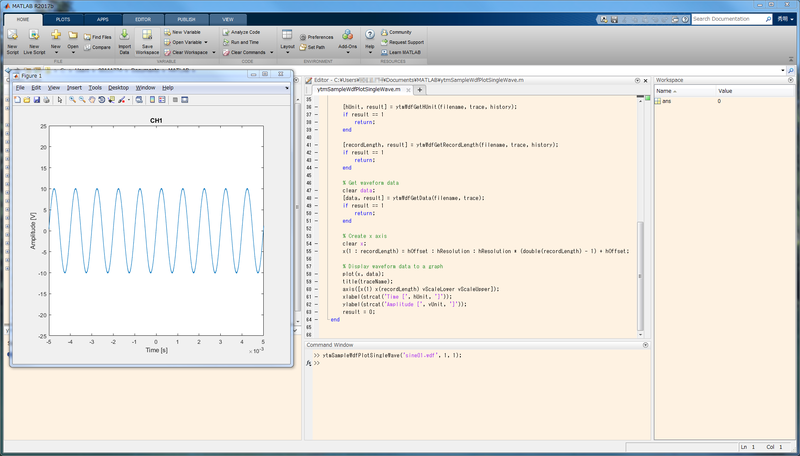 MATLAB WDF Access Toolbox run on MATLAB and load WDF format waveform data into MATLAB. To control the instruments from MATLAB, please use MathWorks Instruments Control Toolbox. The files listed below will be provided. ytmSampleWdfPlotMultiWave - Sample function for WDF read. ytmSampleWdfPlotSingleWave - Sample function for WDF read. ytmWdfGetData - Get Acquisition Data from Yokogawa WDF file. ytmWdfGetHistoryCount - Get the number of history. ytmWdfGetHResolution - Get horizontal axis resolution of waveform history number. ytmWdfGetHUnit - Get horizontal axis unit of waveform history number. ytmWdfGetLibName - Get WDF API Library Name from file. ytmWdfGetRecordLength - Get data record size of waveform history number. ytmWdfGetTraceCount - Get total waveform trace count. ytmWdfGetTraceName - Get waveform trace name. ytmWdfGetTriggerDate - Get measuring date of waveform history number. ytmWdfGetTriggerOffset - Get horizontal axis offset of waveform history number. ytmWdfGetTriggerTime - Get measuring time of waveform history number. ytmWdfGetVLowerScale - Get vertical axis lower scale of waveform history number. ytmWdfGetVUnit - Get vertical axis unit of waveform history number. ytmWdfGetVUpperScale - Get vertical axis upper scale of waveform history number. Please use MathWorks Instruments Control Toolbox for instrument control API. Please select WDFAccess.mlappinstall file from MATLAB application tab “Install Application” and install MATLAB WDF Access Toolbox. Or double click WDFAccess.mlappinstall file and install into MATLAB. The instruction document and sample scripts are included in the file and you can refer them from MATLAB. To use this feature, you are required to install a third-party compiler on your system. Please visit the web page for more detail. Support for the DLM3000 series.